Memorize scripture?! Ain’t nobody got time for that!!! I have wrestled writing this long enough, not because I feel I have the ultimate answer & authority in scripture memorization, but because, for one, I think “Why would anyone want to use what God gave me to memorize His Word?” And second, because if memorizing His Word is truly your desire, your life is about to take on a whole different perspective & I wasn’t sure many would want that. Before I left on a mission trip in July, we were asked to journal. Journaling should be easy for someone like me, but I sat in front of a notepad & just stared with nothing to write….nothing! That usually doesn’t happen, but it did & so I prayed. He answered very quickly, “Not what I have for you, I have something different before this trip.” And before I knew it, He led me to scripture after scripture, passage after passage & put before me a method of how to retain them to memory. At first, I was skeptical at being able to memorize these scriptures, especially when I was given Romans 3:22-24 & 1 Peter 3:15-16, but then it hit me so heavily on my heart. This really wasn’t about memorization, but a way to the Father’s heart. This wasn’t about being a walking Bible, but my walk with Jesus. This wasn’t about being a know it all, but knowing the One that knows it ALL! Each scripture I came across had the gospel all over it. He was preparing me for this mission trip like none other I had ever been on. Every single scripture He gave me was used in specific circumstances I was placed in during that trip! I knew then this method of memorization was more for me than those I had the privilege of getting to share or encourage. I also began to realize how crucial of a tool it was to effective evangelism & discipleship! Four months and 60+ scriptures later, this skeptic is amazed at her old noggin, but even more amazed at the incredible change in the renewing of her mind, the focus she has on scripture when life gets a bit chaotic, & how much her faith has grown in His Word in such a little bit of time! I have even began to realize there is a melodious rhythm to scripture, almost like a song sung by the Rock of Ages to His people, beating in our hearts for us to just get in sync with. They say people live life to the beat of their own drum. I have found the beat I want to live my life to & cannot keep it to myself any longer. Ready to see life a little differently, through the eyes of His Word? I’m warning you, this is a lifestyle change, not just a “let me memorize a few scriptures to help me through this tough spot & then I’ll be fine.” This is a “life changing, discipleship making, God breathing, kingdom minded” decision! And don’t think once you begin getting His Word in you that life is just gonna be smooth sailing. Let me give you a heads up now, the enemy does not like it when we begin to equip ourselves DAILY with the Word, armoring ourselves against his pitiful schemes & tactics. If you are still reading this, I’m assuming you are serious or are just curious as to this memorization method. Either way, He has drawn you in because He knows how important & powerful knowing His Word & sharing it to this lost generation is. Without further adieu, here are pictures & directions. Please let me know if you have questions or another way that helps you memorize scripture! You can use a recipe box, a baggy, an envelope, whatever works. 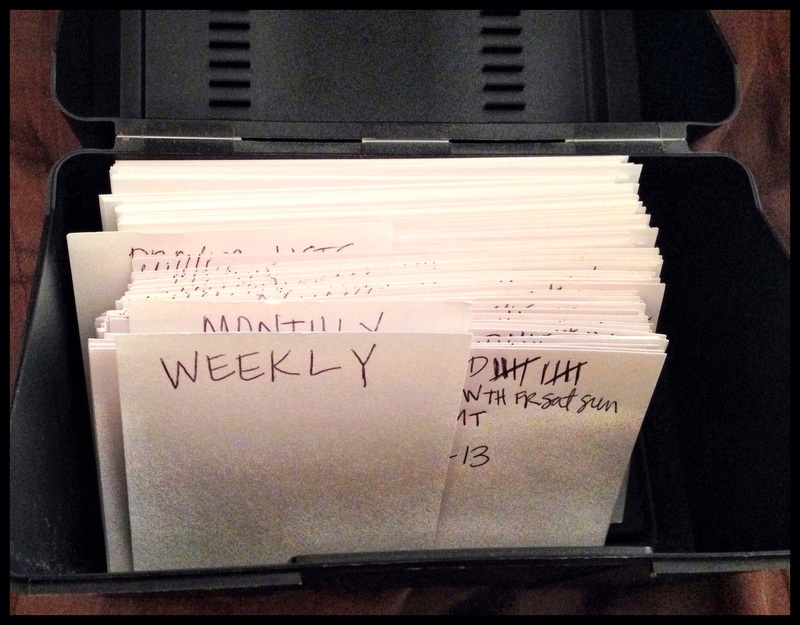 I cut an index card long enough to stick up a bit to divide my index cards from Daily, Weekly, & Monthly. 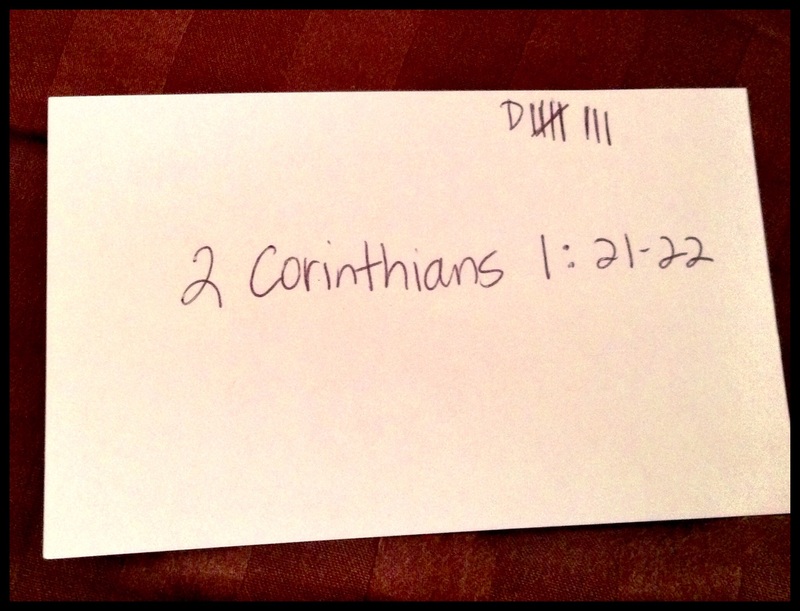 Whenever I stumbled upon a scripture that spoke to me or I kept seeing over & over I would write the address on one side & scripture on the other & put the letter “D” on the upper right hand corner & place behind my daily divider. 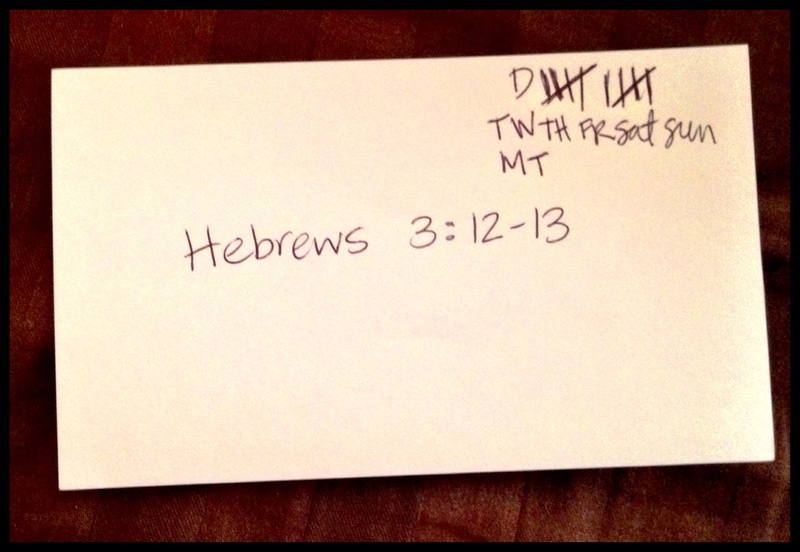 Everyday I would say that scripture 10 times for 10 days, using tally marks to record my progress. The scripture chosen to memorize should be easy to flow out of your mouth at the end of this step. After those 10 days, that scripture got placed behind my weekly divider. 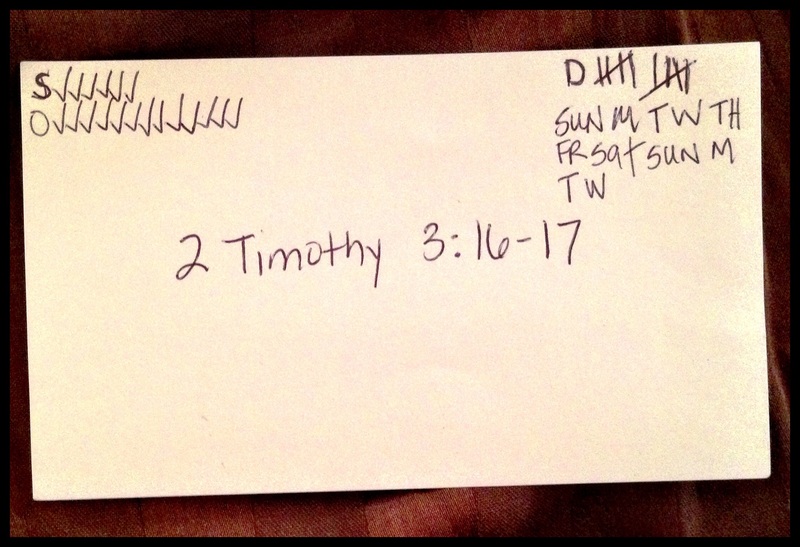 The weekly scriptures get spoken 5 times a day for 10 days. By this time, the scripture should be complete rooted in your heart. 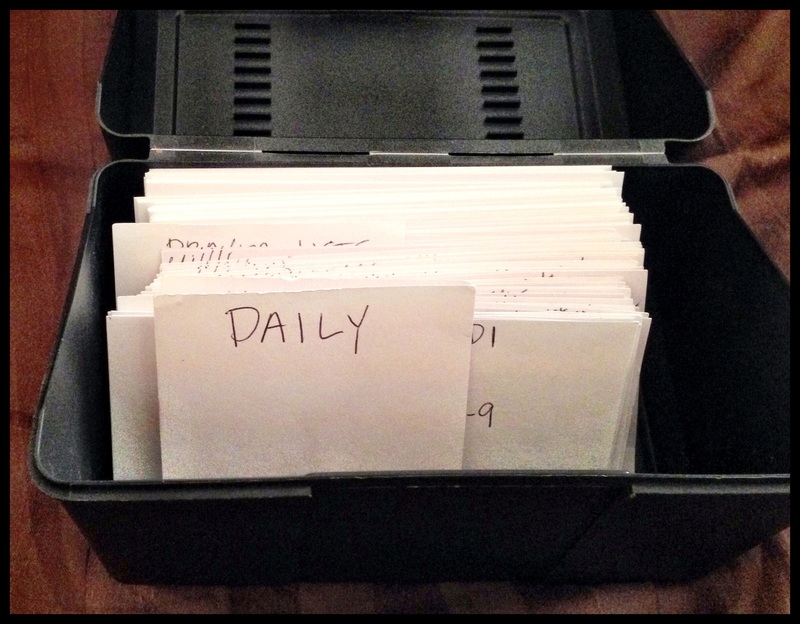 If you are still having trouble with it, it should go back in the daily divider till it has been taken root better. Thankfully, I have never had to do that. I wrote the day of the week on the upper right corner under the daily tallies. I said this verse 5 times for 10 days in case you missed it. Once these scriptures get placed in the monthly, I would say these once a day for a year. 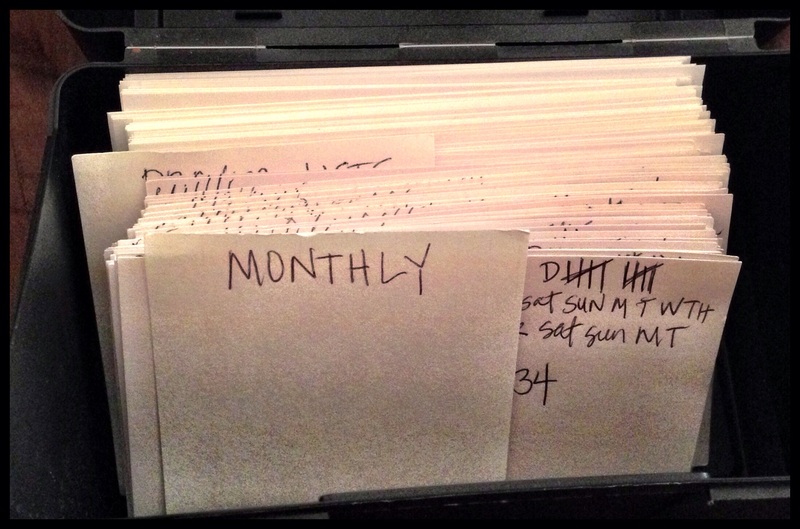 I would place that tally on the upper left hand corner with the letter of the month. Well, there you have it! Simple, right? Yet, statistics & studies show His Church is full of biblical illiterate believers….and we wonder why many believers live defeated lives & the gospel is not being shared.